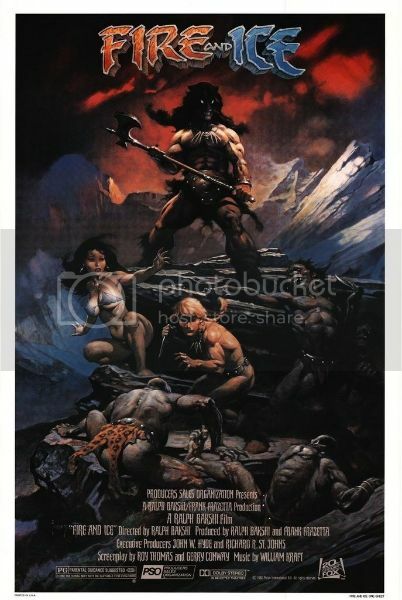 it's a film directed by Ralph Bakshi and based on a story, characters and artwork by the legendary fantasy illustrator Frank Frazetta - FIRE & ICE was released in 1983 but did very little box-office wise. I LOVE THIS MOVIE! Bakshi used the same 'roto-scope' animation technique employed on his LORD OF THE RINGS animated effort. the soundtrack is fantastic and it has some kick-*** characters. there is a special edition dvd due out soon courtesy of BLUE UNDERGROUND. any other fans of DARKWULF, NEKRON and co. out there? This video box has always caught my eye at the video store, but I've never rented it. I always wondered if it was good. Now maybe I'll check it out. Watched Fire and Ice (1983) and it is indeed excellent stuff! Lots of action and the animation looks fantastic, I love the rotoscoping technique. The characters are cool and here we have one of the hottest girls ever, Teegra. I don´t know why i waited so long, i´ve had the dvd for years and years. I´m gonna watch this one again real soon!